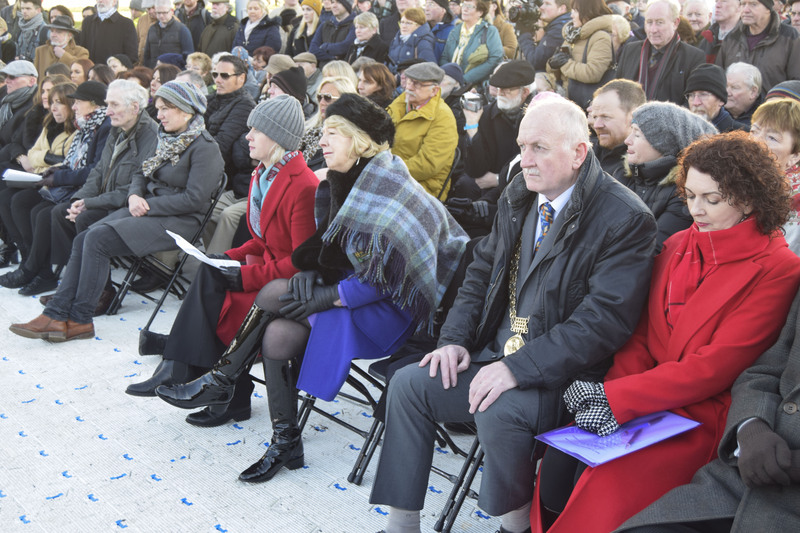 Yesterday a ceremony took place at half-three on Sheriff Street revealing a new statue erected to commemorate the 35th anniversary of Luke Kelly’s death. 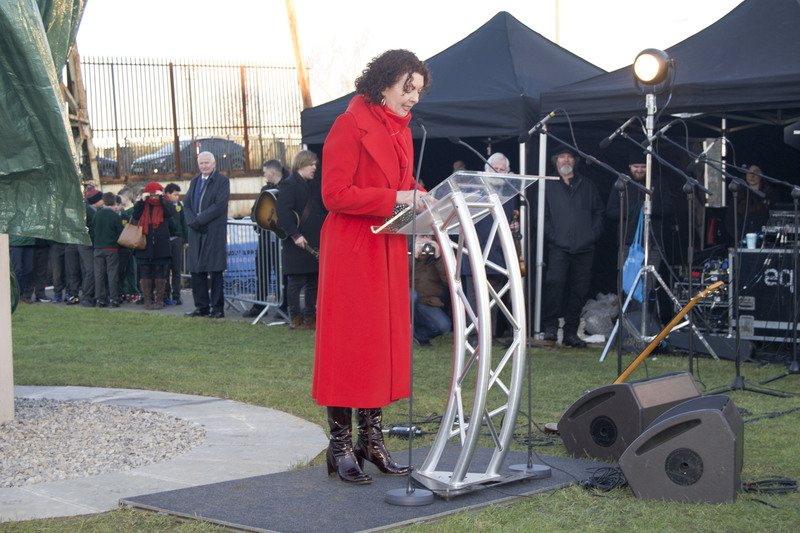 There was a great turnout from the public and the event was attended by President Michael D. Higgins and his wife Sabina along with the Dublin based artist of the sculpture Vera Klute and Luke’s niece Paula McCann. Klute was commissioned by the council to create the memorial piece, the design is based on Luke Kelly immersed in song. The new installation was completed in Italy and It stands at 2 metres high on top of a concrete plinth. 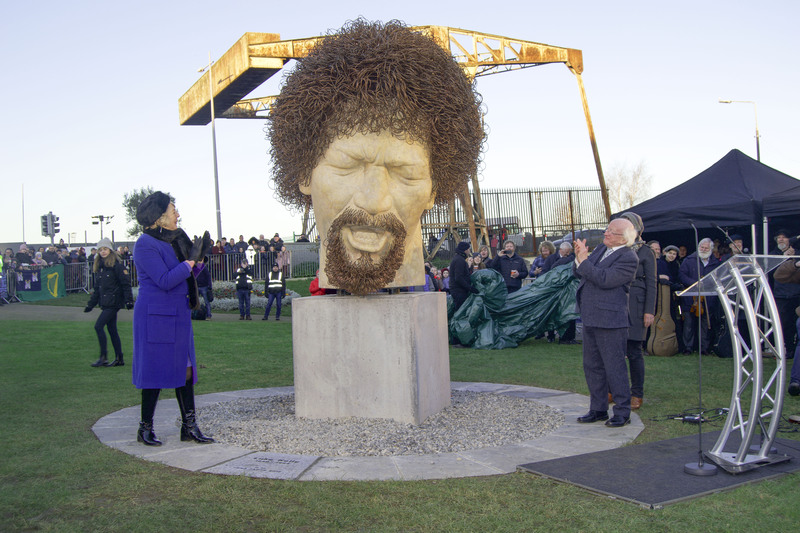 It is a portrait sculpture of Luke Kelly’s head made from marble with Kelly’s distinctively wild red hair represented through coiled metal. “Luke’s presence is still felt on the streets of his birthplace Sheriff St. and the pubs and haunts of the literati circles around Grafton St./Baggot St. where he frequented. This is a unique celebration for a very unique man. To this day he inspires Irish and international artists through his words, songs and activism. It is only fitting that we celebrate the man, the music and his immeasurable impact on the Irish music scene and wider Irish culture”. Born in 1940, Luke was a native of Sheriff Street living in Lattimore cottages for the early years of his life and was moved to Whitehall when the council found his family a house there after a fire in the one on Sheriff St. But Luke’s fondness for the Sheriff St area had him travelling back frequently to play football with his friends but more importantly for him to keep up his favourite hobby, his theatre group. On from the stage and into the folk scene in Manchester Luke picked up his trade from folk revivalist Ewan McColl and came back to Ireland with a burning passion to sing the ballads. He paved the way for a resurgence in the traditional irish music scene during his time in The Dubliners and his voice will be forever instantly recognizable worldwide. The Sheriff street sculpture is one of two sculptures unveiled this week, both befitting of an Irish musical legend.